Flora 717 is born a sanitation worker, but as soon as she emerges into the hive it is clear she is not like other bees. She displays an aptitude for other jobs and spends times working in the nursery and foraging outside with bees in other kin groups. But there are other things she does outside her preordained role as well, things she must keep secret or she could be punished for treason. Paull's novel describes a society that is unrecognizable to us, and this creative world-building is the great strength of the novel. Somehow she managed to put herself inside the mind of a bee and extrapolate from that what their world must be like. They rely on different senses, receiving much of their information from scent, and they can hear the "hive mind" in addition to individual voices, and transfer information without speaking. Their feelings aren't like ours either, with few emotions that could compare to ours, and different moral codes. Bees killed other bees without repercussion, but it was forbidden for anyone but the queen to breed. The details of day to day life were also new and unfamiliar, yet recognizable if you know anything about bees. Their food includes "pollen bread" and the honeycombs are referred to as "the treasury." Flora spoke about her body as though it was a piece of machinery. When taking off she "started her thoracic engine" and the way she referred to her wings and legs was also kind of mechanical. The bees also had their own mythology, the stories collected in panels in a special area of the hive. One of the stories told of "the visitation" which, to us, is when a person comes and collects honey. It was just so fascinating, I could go on and on about all the details of Flora's life and home. I chose to listen to the audiobook because it was narrated by Orlagh Cassidy, who is one of my favorites. She also read The Piano Teacher and Before I Go To Sleep. Her rendering of this novel was quite lovely and enjoyable to hear. Reading this was like being immersed in a very different, much smaller, world. It's the sort of book that doesn't need much of a plot, but it still has one. The Bees has been long-listed for the Bailey's Women's Prize for Fiction and I wouldn't be surprised if it made some other lists as well. It's one of the most unusual books I've read and, by the way, I am terrified of bees. 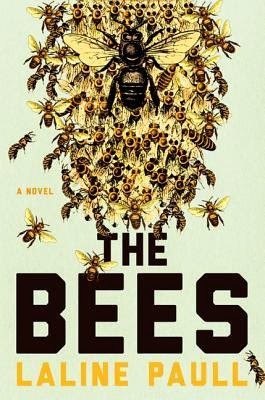 We're getting a hive at the library where I work, which is not something I'm especially excited about, and I couldn't stop thinking about it while listening to this book. I don't think anyone who reads this can ever look at bees quite the same way again. Highly recommended for anyone who likes literary fiction.